With the political season heating up and Presidential candidates jocking for position and attention, Senator Hillary Clinton and Gov. Mike Huckabee streamed LIVE once again on Ustream.TV. 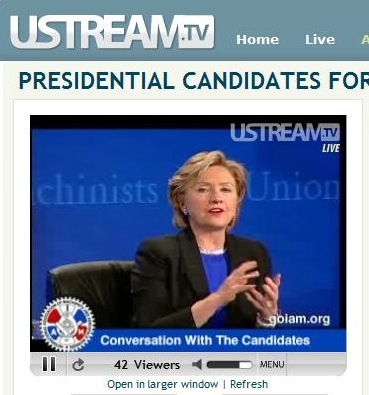 Senator Clinton first appeared on Ustream from a breakout session at the YearlyKos convention. Gov. 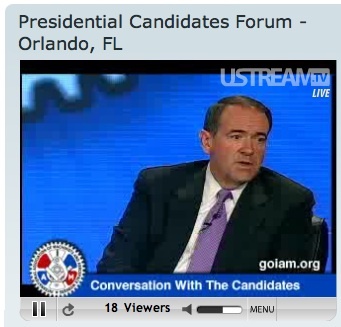 Huckabee is the first major Republican Presidential candidate to stream live on Ustream. Both appeared before a large audience in Orlando, FL at the IAMAW Staff Conference.